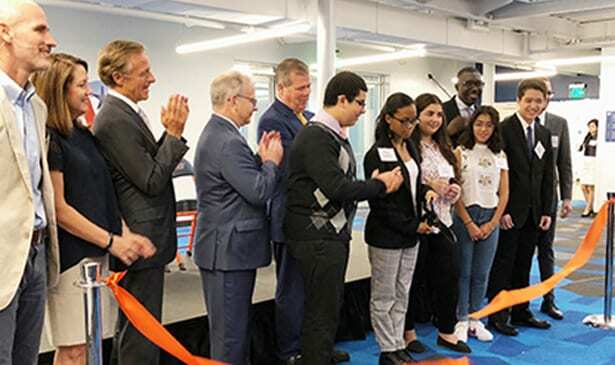 NASHVILLE, TN — Following a strong turnaround in test scores from children from low income families and diverse backgrounds in Valor Voyager Middle School, the charter school organization opened a new college prep high school designed for diverse and low income students. The new school, Valor Academy and College Prep high school is located next door to Valor Voyager Academy & Valor Flagship Academy middle school. During a ribbon cutting for the high school, Governor Bill Haslam, Mayor David Briley, former mayor Karl Dean and head of Metro Nashville Public Schools Dr. Shawn Joseph praised the school’s leadership team and teachers for strong performance from its students. The bragging point for the school is that the two middle schools, which opened before the Valor College Prep, college prep high school succeeded in inverting the achievement gap of its students, with 55% of their economically disadvantaged students on-track, flipping the test results from disadvantaged schools and helping students achieve 96% on standardized tests-outperforming several schools with non-economically disadvantaged students. “I want to applaud Valor for closing the achievement gap in 2018 for the 4th year in a row – Valor’s network has taken economically disadvantaged students and have them out perform non economically disadvantaged students across the state that’s incredible,” said former Nashville mayor Karl Dean. Karl Dean and current mayor David Briley shared the stage with Governor Bill Haslam and Superintendent of MNPS Schools Dr. Shawn Joseph. “We have a new high school and students are going to do great things. It’s an exciting time to be in Nashville,” said Dr. Joseph. He went on to praise the support from Governor Haslam and Nashville mayors. Mayor David Briley congratulated the teachers and students of Voyager Valor middle school. “The most important thing we can do here in Nashville to improve the quality for all is to learn from places where there is excellence and to make sure that it is pushed out to every other place where we have trouble or can do better in our community. … We know as a city, as a culture, that your zip code can be determinative not just for economic and health success. [With] Places like Valor, we have an opportunity to stop that from happening here,” said Mayor David Briley. “I did meet with charter school leaders here in Nashville. I’m essentially agnostic about what kind of school our children get to go to, as long as it is excellent. We have work to do. Dr. Joseph and I are working together as a team to make sure we make progress in that regard…One of the great things I’ve seen about Valor is the focus on social and emotional learning. Dr. Joseph and I are committed to make sure we have more resources at play to focus on that,” said Briley. The Valor College Prep School (located on Nolensville Pike Road) was transformed by Manuel-Zeitlin architects from a former Lowes Hardware building into a multi-level high school. The school will started with 240 freshmen students this school year and gradually add one new freshman class each year until all grades 5-12 are fully enrolled. Valor Academy’s CEO Todd Dickson was recruited to come to Nashville by former mayor Karl Dean. Gov. Bill Haslam was introduced by Youseff Botros – a student who moved to Nashville from Egypt and despite initial struggles, is now near the top of his class. “You’ve heard that both of Valor’s middle schools were recognized as Reward Status schools which means they stood out. This is a school that is purposeful about diversity–it’s one of the key parts of their mission. And they are not just succeeding but they are wildly succeeding. … this is a school where you have economically disadvantaged students outperforming the state’s average for non-economically disadvantaged students. I can’t tell you how extraordinary that is,” said Haslam.